Comes fresh directly from US government contractor. 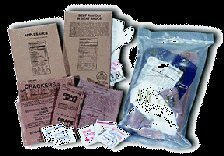 Fully prepared and ready to eat meals. This item comes with a flameless ration heater which is activated by water. 12 meals per case. 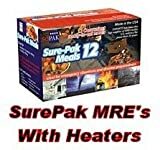 Sure-Pak 12 meals (12 of each: entree, side dish, desserts, cracker packs, spreads, beverages, and coffees along with condiments). Range of main entree types include: beef stew, beef ravioli, chicken with cavatelli, black bean and rice burrito, cajun rice with beef sausage, minestrone, beef with mushrooms, spaghetti with meat sauce, meat loaf, chili macaroni, grilled chicken breast, chicken and rice pilaf, cheese tortellini, jamaican pork chop, country captain chicken and others. Dimensions: 16.75” x 9.25 ” x 11”. NSN: 8970-01-321-9153. Storage life 22 months when stored in 100 degree temperature. Storage life 55 months when stored in 90 degree temperature. Storage life 60 months when stored in 85 degree temperature. Storage life 76 months when stored in 80 degree temperature. Storage life 88 months when stored in 75 degree temperature. Storage life 100 months when stored in 70 degree temperature. Storage life 130+ months when stored in 60 degree temperature. DIMENSIONS: 16.75" X 9.25 " X 11"